WILDLIGHT, FL. – Aug. 28, 2018 – Today, Skinner Bros. Realty announced that national ice cream chain, Cold Stone Creamery (Cold Stone), and locally-owned Tasty’s fresh burgers and fries (Tasty’s) will be the first two tenants in the real estate developer’s commercial building in Wildlight. Earlier this year, Skinner Bros. Realty purchased a three-acre parcel at the corner of Wildlight Blvd. and A1A to construct the first multi-tenant retail space for the new town in Nassau County. Construction on the multi-tenant retail space began in early August. Both Tasty’s and Cold Stone are expected to open next year. and rental apartments together with shops and restaurants, a new elementary school and a system of trails and pathways intended to make it healthy and walkable and connect it all together. Our Phase 1 plan is flexible and currently designed for about 1,000 homes across about 260 acres plus nearly 350 acres of permanently preserved open space. Wildlight will offer comfortable and friendly Florida Lowcountry living 20 miles north of Jacksonville, just east of Interstate 95 on A1A, with easy access to both Amelia Island and the Jacksonville International Airport. Wildlight is being created by Raydient Places + Properties, a taxable subsidiary of Rayonier Inc., a real estate investment trust. For more information please visit Wildlight.com. 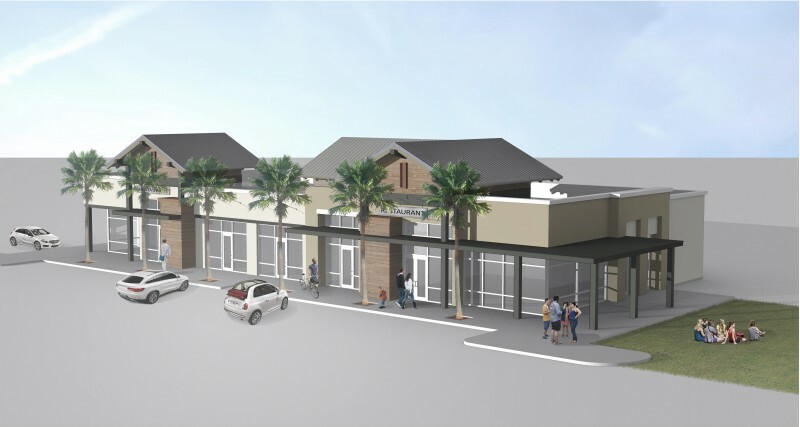 Cutline: Initial rendering of Skinner Bros. Realty’s multi-tenant retail building for Wildlight. Renderings are subject to change. Images provided courtesy of Skinner Bros. Realty.